Food Revolution Day (FRD) is an annual day of awareness, started by chef and healthy food campaigner Jamie Oliver, which aims to raise the profile of food education as a key to transforming the lives of millions of people around the world. This year, the Ottawa Farmers’ Market and me, Ottawa’s Food Ambassador for the Jamie Oliver Foundation, are spreading the message about the Food Revolution at the Brewer Park Market on Sunday, May 19th. It is very exciting for all of us to be involved in a truly global event with thousands of followers. I think that the Ottawa Farmers’ Market is the perfect venue for this year’s FR Day as everything we need is right there–fresh vegetables, fruit, meat, cheese and other prepared products. Best of all, they’re local and you can talk directly to the farmers who produce everything. Cooking skills are no longer passed down from generation to generation in the way they used to be. As a result, we now eat more convenience and processed foods than ever before, having lost our connection with what real, healthy and wholesome food is–we need a Food Revolution. Worldwide, according to the Jamie Oliver Food Foundation, obesity has more than doubled for adults and tripled for children over the past three decades. For the first time in world history we have over one billion people overweight or obese. That’s 1.5 billion adults as well as 43 million children under age five who are overweight or obese. Over 2.8 million people die each year as a result of being overweight or obese, making this problem among the leading risks for global deaths. This does not even include other health-related problems such as poor concentration and some diseases. But the good news, as we can learn from the Food Revolution, is that obesity is both reversible and preventable. We need to get back to basics and fight back. Kids who learn to eat and appreciate real food as well as how to cook and even grow it will likely keep these as lifelong habits. The Jamie Oliver Food Foundation states that kids who eat nutritious meals have improved academic scores and reduced absences. Home-cooked meals are higher in nutrients and fibre, lower in trans and saturated fats, sodium and calories and do not contain any unknown additives and fillers. People always tell us how lucky we are that our daughters are such healthy eaters. When the girls were being introduced to solids as babies and to any new foods after that, we simply served them real food, never assuming that they might not like it. We wanted them to learn that this is what people eat. Now, they eat almost everything and nothing processed. We need to educate each other on real food–on where it comes from, how it grows and why we need it. Anyone can support the Food Revolution anytime with something as simple as holding a dinner party using fresh ingredients or trying a new type of fresh food, preferably local (and available at your local farmer’s market! ), or bringing someone to the farmers’ market for the first time. Join us at our booth between 10 and 2 as we sample the great food of Ben Baird chef and owner of Ottawa Streat Gourmet, post your thoughts about what real food means to you on our food mural, pick up new recipes and take part in our art activities for kids. Come and see what’s fresh so far this season along with Chef Baird who will be working with these fantastic ingredients. At the Ottawa Farmers’ Market, I am inspired by good, whole foods and to share the Food Revolution’s message. Cook it, eat it, live it. 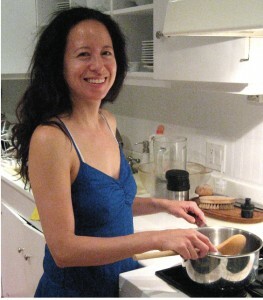 Jennifer Chang volunteers for the Food Revolution as a Food Ambassador in her spare time to further the mission of the Jamie Oliver Food Foundation. She decided to join the movement because of her desire to spread the message that cooking dinner with good ingredients from scratch (even after work!) can be simple, as well as for her love of real food and her two daughters who love vegetables. For more information, send an email to ottawafoodrevolution@gmail.com.